Today’s show is all about safety! Well, except the parts that are about caulk and spalling brick. Technically, those parts are not about safety. But that doesn’t make them any less interesting or valuable! 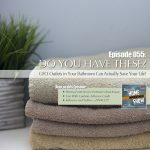 For example, if you’ve ever wondered why we use caulk on a paint project, or what the 30-year, 40-year, and 50-year references on each tube mean, then this segment is for you! 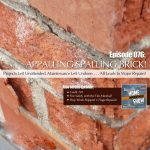 And if you’ve got a brick chimney or any brick on your house at all, you do not want to miss the segment about spalling brick. The info here could save you hundreds of dollars in the long run. And then . . . there’s the actual safety segment I referred to in the beginning! 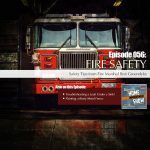 Holland’s Fire Marshal, Bret Groendyke sits down with us to talk about some great tips to help us stay safe should we ever experience a fire in our homes. It’s great info and perfect for everyone in the family! Today we sit down with Holland’s new Fire Marshal, Bret Groendyke to talk about fire safety. According to recent statistics, the number of fire deaths among people 60 and over is rising. We discuss why that could be happening and what we can do about it. We also talk about how to troubleshoot a leak under a kitchen sink, and how to paint a metal fence so you have perfect results every time! We are hoping this PSA saves lives. Or at least starts us on the way. We came across an alarming statistic that says 40% of fire deaths are those over 60. And that number is climbing. The great thing is, there are things we can do for ourselves, our loved ones, and our neighbors to bring this number back down. We are lucky enough to be joined in the studio by Holland's new Fire Marshal, Bret Groendyke. Bret's goal is to make people aware of simple things most of us have never thought about, that can actually save lives in the event of a fire. We didn't know there is actually maintenance that has to be done on a smoke detector. These segments are absolutely worth a listen! Ok, we've all been there, right? We pull the trash can from under the sink and the trash is actually floating. We are instantly filled with dread and terror. How did this happen?!?! Where did all this water come from?!?! How much is this going to cost??? Well, we know the water came from somewhere in the sink area.....obviously. But we don't know specifically where. We are left wising we could figure out what's going on, without calling the plumber. Maybe it's an easy fix. And when the plumber comes and tells us how simple the problem is, we feel a bit foolish. So we decided to take matters into our own hands and give you a few ways you can troubleshoot the problem, before calling the plumber. Maybe you can fix it, maybe you can't. But you certainly feel good knowing you identified the problem on your own! We got a great questions from a listen about painting a rusty steel fence. He is replacing the posts with wood but something HAS to be done with the steel. He'd like a paint solution and, of course, we have a great one! It's a solution that can be used with almost any steel you would want to paint. This show has a little of everything! We talk about GFCIs and why those little buttons should actually be used. We talk about a couple new electrical gadgets. And one will save you money if you have kids! And because Dan needs his own segment, we have a great one called Use With Caution. And finally, we are airing the last segment from last week because it didn’t air due to technical difficulties. It was too good to let slip by! Betsy has her own segment so it's only fair that Dan should have his own, right? 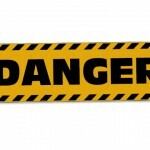 That's why we are introducing a new segment, very appropriately named, "Use With Caution!" In this segment we tackle silicone caulk. A lot of people think caulk is just caulk and that the more water resistant it is, the better. However, we recommend using it with caution for a reason! If you use it for the wrong application, the consequences can be almost tragic. We might not all know that GFCI outlets can actually save our lives. Any place that has water present should have them. We also might not be aware that those little buttons in the middle of the outlet should actually be pushed regularly to test the outlet. In the studio with us to explain the finer points of GFCIs is Brad Krause, Master Electrician and owner of Service Professor. And don't think they only do electrical! They do everything from heating and cooling, plumbing, and electrical to air duct cleaning (that's duct NOT duck!). And they have outstanding customer service. There's a reason these guys (and ladies) get stellar reviews! Segment 4: Thomas Jefferson and Yellow...FINALLY!! Last week we had some "technical difficulties" and segment 4 didn't air. The problem is, the segment was too good for people NOT to hear it! Who knew that Thomas Jefferson was such an amazing interior decorator?! I’ve got a number of tubes of caulk in my basement, on my shelves, that are dried out. And that number is 10. Yes. Ten 1/2 full or 3/4 full tubes of caulks of assorted colors and types that have all dried out. I discovered this the other day when I, of course, needed to do some caulking. And, of course, I didn’t buy any caulk because I knew I had at least $40 worth of caulk on my basement shelves. However, when I went down there to get it, I quickly realized that all of those tubes were no good. I had used them earlier and had never sealed them correctly to prevent them from drying out. And, as a result, they dried out. Well, I know that I can at times be pretty dumb when it comes to home improvement stuff, but I also know that I’m not the only one. So, I thought I’d share with you two great ways I discovered after that experience that will help you keep your caulk ready to use. 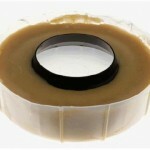 Take the wax ring and put it in a small container that you can seal. (you could use a tape cannister, possibly film cannisters, or anything along those lines. The goal is to put the wax in a container that you can seal so it stays pliable, but also so it doesn’t get all over the place and make a mess). When you’re done caulking for a day or for a month or whatever, simply open up this cannister with the wax and press the tip of the caulk into the wax (preferably a couple inches). The wax will fill the nozzle perfectly and will create a perfect seal. When you’re ready to caulk again, simply pop the tube into your gun and squeeze the trigger. The wax seal will be expelled just ahead of the caulk–which will still be perfectly good! Start by taking one of those little latex “doctor’s” gloves and then cutting the finger off. Drape this “cut-off finger” over the nozzle of the tube of caulk and then wrap some tape around the base to seal it. When you’re ready to use it again, simply pull the seal off and your caulk should still be usable. Now, while both of these methods are inexpensive and should work well, I still like the simplicity of the wax ring idea. I don’t have to mess with tape, I don’t have to worry if I got the little finger thingy taped down tightly enough, etc. And, best of all, when I want to use the caulk again, I just pop it in the gun and pull the trigger. I don’t have to mess with pulling tape off after it’s been sitting on a tube for 4-5 months. If you do any amount of caulking, give one of these methods a try–either one is way better than the old “put a nail in it” method and will produce much better results! OK, that title is convoluted at best. But it’s more attention-grabbing than the first title I tossed up there: Silicone Caulk–Use With CAUTION. Yeah, after typing that, I almost fell asleep. So I changed the title in the hopes of infusing it with energy and lively interest. Anyway, if you read the earlier post about cheese graters, you’ll realize what I’m getting at here. If you missed the post about cheese graters . . . well, you need to check it out (here!). The point of that post was to poke fun at myself and stress the point that there are certain items out there . . . in the wide, scary world . . . that look innocent, but can really screw up your day. Cheese graters and dental picks are just a couple. Today, we’re shifting back into the world of home improvements and were going to talk, as the title suggests, about the Cheese Grater of the Home Improvement World: Silicone Caulk. See, silicone caulk, if you’re not familiar with it, is a type of caulk that sticks tenaciously to almost any surface. It’s also extremely water resistant. Those two qualities make it tremendously useful . . . but also, “sneakily” dangerous. Let me explain: silicone caulk is so resistant to almost everything, that nothing . . . NOTHING . . . will stick to it. It repels water, moisture, paint and even itself. And that’s where the danger lies. Every now and then, folks pick up a tube of silicone caulk by accident at a home improvement warehouse. They just wander down an aisle, grab a tube and take it home. Then, they go ahead and do all their caulking. They caulk around their woodwork, around their windows, around their crown molding . . . they caulk everywhere. And then, after all that work is done, they start painting. And that’s when they notice that the paint doesn’t seem to be sticking. At all. Wherever they applied their caulk, they discover the paint won’t adhere. Now normally, when this happens, people are sad. They’re frustrated. They’re angry. But they’re usually not flipping out yet. And this is because they don’t understand the nature of silicone caulk. They figure they’ll just buy some new caulk–some paintable caulk–and they’ll put that over the silicone. Or, worst-case-scenario, they’ll prime all the silicone caulk with a special primer before they paint. Either way, they figure there’s a relatively simple solution. But unfortunately, there’s not. As I mentioned earlier, nothing will stick to silicone caulk. I even used ALL CAPS to express that idea. Nothing will stick to silicone–not even silicone. And that means the only way to truly fix the problem is to remove the caulk. Completely. Now, for some people, caulking and painting a room is bad enough. Not everybody wakes up every morning, just longing for another paint job to accomplish. But even if you like painting and caulking, nobody likes caulking, painting, discovering a problem, removing the caulk, scrubbing the walls, re-caulking and finally re-painting. That’s just no fun at all. And that’s why I’m suggesting that silicone caulk needs to be used with caution. In the right situation, it can’t be beat. In a bathroom, between your tub surround and your tub, it’s ideal. But in an area where you plan to do some painting . . . avoid it like the plague.